This charming southern style home was built custom in 2003 by O’Rourke & Associates, and it’s as gorgeous inside as it is outside! Featuring 4 bedrooms, 2 full / *2 half baths, over 3,000 finished square feet and loads of upgrades including an in-ground pool, lawn irrigation, the huge wrap-around porch, dual HVAC, 9 ft Ceilings and Beautiful Oak Hardwood floors throughout the Main Level, enhanced finishes and great closet space throughout. 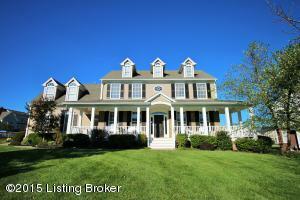 The soaring 2 Story Foyer is flanked by the Formal Dining Room and Spacious Family Room. The Large Eat In Kitchen boasts custom Maple Cabinetry, Stainless Appliances, a spacious Peninsula Counter Top, & Easy Access to the Pool/Extended Patio. The main level also features one of two half baths, and 1st floor laundry.